As the months move on we know to expect more and more rainy days. These can cause the most routine activities, like walking the dog, cycling to work or taking the kids to school, to become a chore once the weather starts to turn. Most of us keep a waterproof jacket or two in our wardrobes ready for the wet weather, but do we all look after them as we should to ensure they’ll keep us dry at the first sight of rain? Have you found yourself outside in a sudden rain shower and noticed that your waterproof is clinging to you; the water is not beading and running off, and underneath you start to feel cold and damp? That‘s enough to put you off being outside and more importantly is signalling that your jacket needs some urgent TLC! Caring for your outdoor clothing can mean the difference between continuing to enjoy being outdoors and hibernating away inside during autumn and winter. Below are some handy tips and guidance on prepping your rain jacket to ensure you can venture outside, whatever the weather! Firstly, standard household detergents should be avoided when caring for your waterproof garments. It’s a common mistake to pop your dirty waterproofs in with your normal washing load, but this will result in them not performing as they should. Household detergents leave water-attracting residues on the fabric, meaning that instead of repelling the water in a rain shower the garments soak it up instead – an effect known as ‘wetting out’. As a result a garment’s breathability decreases – by up to 70% – so it gets sweaty inside as moisture can’t escape. And you? You end up feeling clammy, wet and uncomfortable. 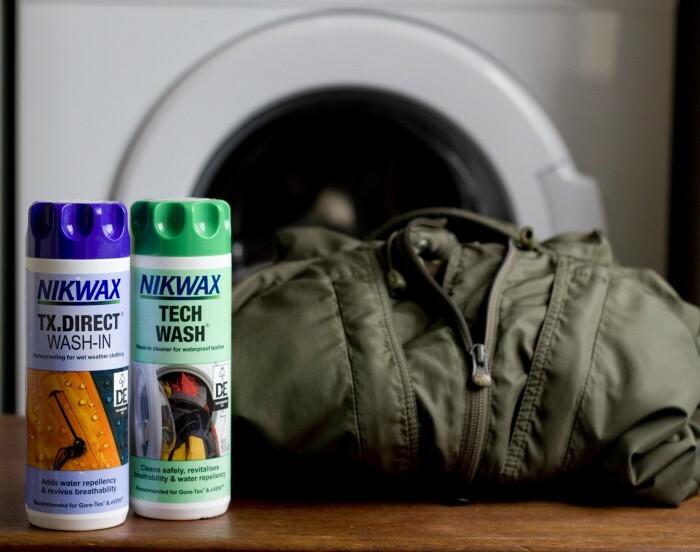 Clean the garments with Nikwax Tech Wash, which has been specifically designed to safely remove dirt and other contaminants from breathable waterproof garments, helping to maintain the durable water repellency (DWR) on the outer fabric of the garment, rather than mask it. DWR will stop water being absorbed, meaning that moisture vapour can escape through the fibres, rain will bead and run off the garment and you remain dry. Thoroughly worn garments should be re-waterproofed using Nikwax TX.Direct following cleaning with Tech Wash. TX.Direct will replenish the DWR on your garments, ensuring that they perform to the highest standard. After cleaning with Tech Wash simply wash with TX.Direct in a separate cycle, with no drying required in-between. The treatment will penetrate right through – including seams, tapes and cords. Your waterproofs will be breathable, comfortable and work much longer for all those outdoor activities, no matter how routine they are! If your jacket is relatively new or has recently been treated with TX.Direct, then you should suffice with simply cleaning with Tech Wash on its own 4 to 6 times to revive the DWR before reproofing is necessary. Tech Wash and TX.Direct can be used easily in your washing machine; just ensure you clean out the detergent drawer in advance to remove any standard detergent build-up. There is no need to tumble dry the garments following the cycles – the DWR treatment develops easily upon air-drying. Look after yours and your family’s garments now and getting caught in the rain will not be such an unpleasant experience! Clean and reproof with Nikwax – safe for the garments and safe for the environment, containing no harmful solvents and no fluorocarbons. Nikwax® offers more than just waterproofing – it also targets sweat! Do More To Get Outside This Year! Don’t Throw Your Outdoor Gear Away – Donate It! Seeding the meadow with the help of a Nikwax Environmental Grant! Hygge the Nikwax way… embrace a Scandinavian Autumn for ultimate outdoor happiness. Throw away your hibernation coat and get out for spring adventures. Prepare for The Wild Boar challenge, 2017! How to wash your down garments safely. Look after your tent and it will look after you! #GetOutside – what’s your challenge? Get Outside And Get Active! Put Pedal to the Test with Tech Wash & Polar Proof! Nepal Disaster Appeal – you can help! Nikwax Glove Proof – as much of a safety item as strapping on your gloves! Nikwax Photo Competition – The Results! We’ve raised the standard for PFC-free Nikwax Hydrophobic Down™! Adventure-Crossing of the Alps with Children! Nikwax Hydrophobic Down: can it stand the heat… well the rain! Once famous for Cheese – now famous for Challenges! Join us for a 50km charity challenge! World Land Trust needs your votes to help its Caucasian Leopard project! Inspired to take up a challenge for charity? Are you thinking of taking on your very own challenge this year? If so, here are a few suggestions to inspire you to get started! Reduce, re-use and recycle Christmas is the time for giving, so why not give back to the environment and follow our top 10 tips for a greener festive season! So where will the worst weather be? Helen, my co designer and I debate the mountain location for our monthly field testing get together. We plumb for the Highlands as our best bet. Trekking up a hill, skiing on the slopes or cycling deep in a woodland and an emergency strikes – would you know basic first aid techniques at the time of need in the great outdoors? 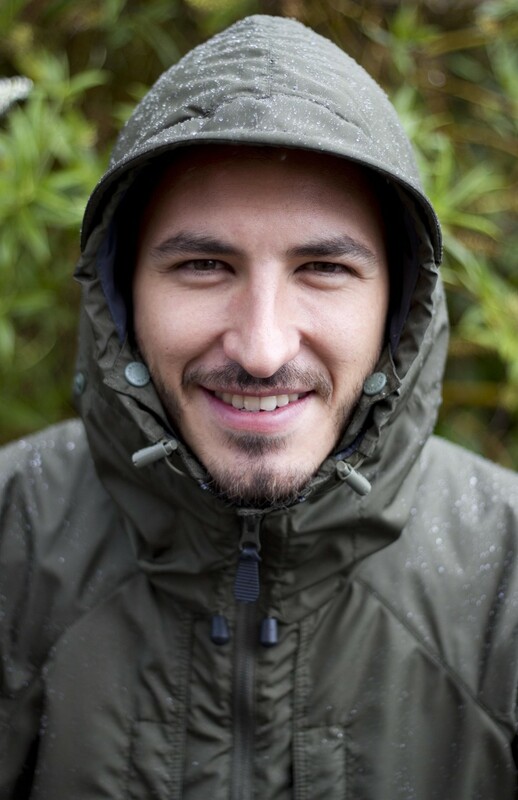 Cleaning and waterproofing your lightweight summer jacket keeps it clear of dirt and adds durable water-repellency. It also ensures it stays breathable to keep you cool in the warmer months. The history of the tent is as unique as the tent itself. From prehistoric times to modern recreational camping, tents have been a part of human comfort and survival for thousands of years. Around this time of year one of our most frequently asked questions is: Should I regularly clean my tent and if so, what’s the best way to do it? Sudan refugees get a helping hand from Nikwax! Make your fleece work harder! Nikwax® has won an OutDoor INDUSTRY AWARD for TX Direct® version 11.1. Nikwax® is Green to the Core! There are currently over 80 members of this 'not-for profit' Association, stretching from Norway to India and from the UK across to the Czech Republic. As a charitable organisation directly funding specific projects, the association wants to proove that the European outdoor industry is committed to putting something back into the environment, and all working together a real difference can be made. The World Land Trust (WLT) is an international conservation charity, which protects the world's most biologically important and threatened habitats acre by acre. Since its foundation in 1989 (as the World Wide Land Conservation Trust), the WLT has funded partner organisations around the world to create reserves, and give permanent protection to habitat and their wildlife.